The Salk researchers infected two lines of plants with a bacteria to determine whether methylation, a type of epigenetic chemical modification to DNA, plays a role in a plant's response to stress. 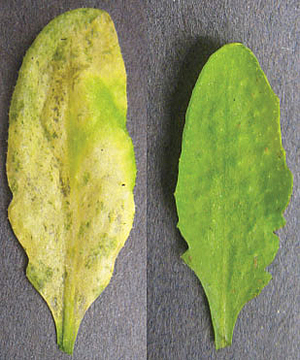 The leaf on the left, taken from a normal plant five days after infection, shows disease systems. The leaf on the right, taken from a mutant plant incapable of methylation, shows no signs of disease, suggesting that methylation functions in stress responses. In the study, published August 7 in the Proceedings of the National Academy of Sciences, Ecker and his colleagues studied how DNA methylation regulates the immune system of the Arabidopsis thaliana plant. Methylation is a biochemical process that, among other things, suppresses the expression of "jumping genes" called transposons that have been incorporated into the genome over time. Using genome-wide sequencing technologies, the researchers found a wide range of methylation changes in the plant's response to a bacterial infection and performed a variety of analyses to determine how these methylation changes alter gene expression.